Jesus MCC Archives - Joe.My.God. Well, that didn’t take long. 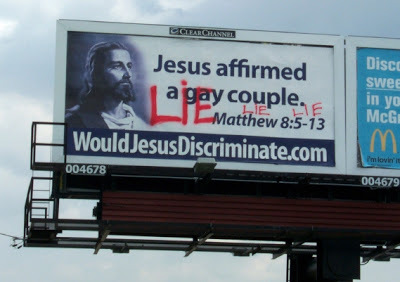 God’s gentle loving people in Indianapolis have already defaced some of Jesus MCC’s startling pro-gay scripture billboards, spray painting “Lie, Lie, Lie” on one of them. Get the story from Indiana LGBT site, Bilerico, who notes that the vandals had to use tall extension ladders to reach the billboards.